Celebrate the television legacy of Gotham’s very own Dynamic Duo™! 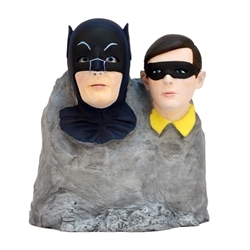 Factory Entertainment’s Dynamic Duo™ Monolith™ features highly detailed likenesses of Batman and Robin, as portrayed by Adam West and Burt Ward, sculpted in polystone and individually hand-finished! This Convention Exclusive variant features our heroes in full color and is sure to please fans old and new!